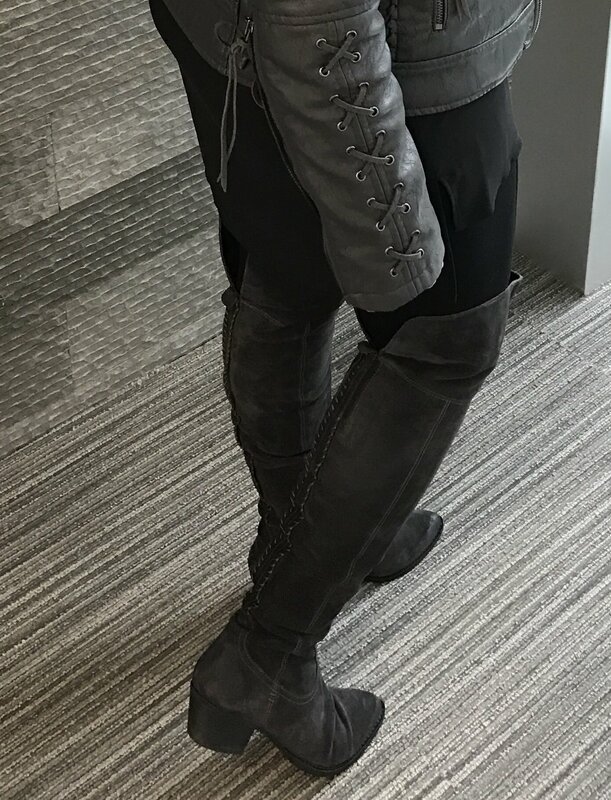 Monday's "Outfit Of The Day"
This gray BlankNYC "Revve Up" moto jacketwith gunmetal hardware was a sure hit today. Thought I'd show some more of the lace up details on the back and on the sleeves of the jacket. New style jacket available at Nordstrom and online. 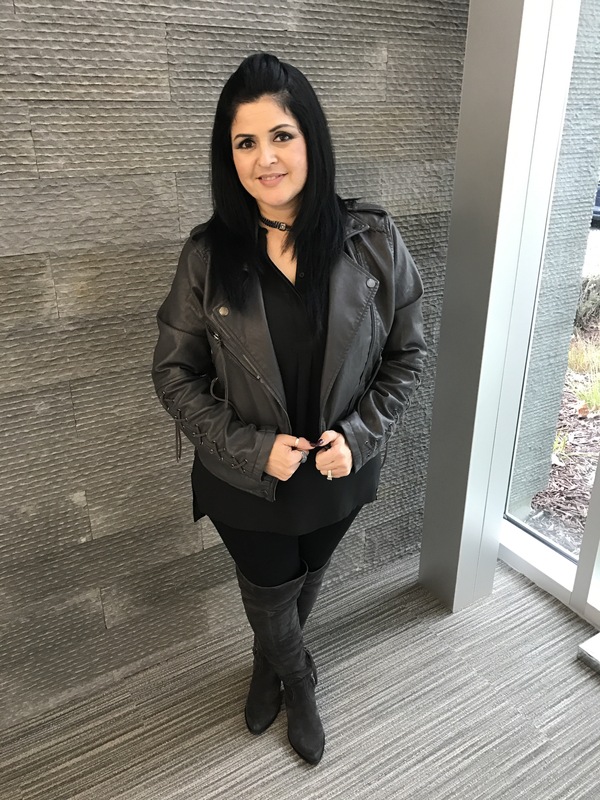 The moto jacket is a great match to the details of my Dolce Vita "Emma" over the knee boots that I purchased online at Nordstrom Rack on Black Friday. The comfort of this boot is amazing. No break in necessary. The regular price on these boots $300 sale price $100. I researched and this boot is sold out everywhere. I did find some on eBay. I will definitely keep an eye out to see if they become available anytime soon. Refer to yesterday's post for eBay links. This choker is a 2-1 which can be used as a choker or a bracelet. In the pic below, it is a gunmetal and leather details available at Henri Bendel. This Doctor Bag has 3 compartments and fits an iPad.The hematite gunmetal studs and hardware ROCKS! My jewelry from Henri Bendel goes great with this handbag. 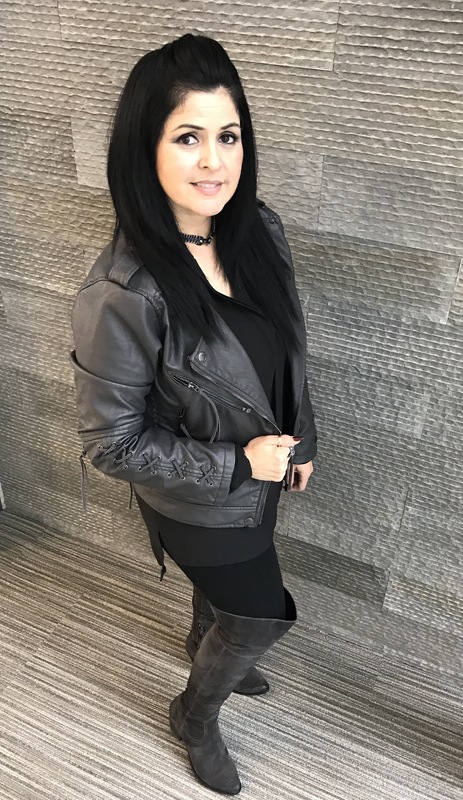 Great quality black leggings by Alfani, sheer top by Pleione available at Nordstrom.